I'm not really the fist-pumping, glass-raised-in-triumph type, but the impulse struck me repeatedly during the Frames' sold-out concert last night at the Bowery Ballroom. 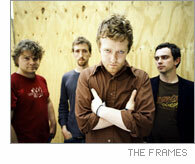 For anthemic rock in 2005, the Frames are the best there is. With a smoothly layered, ringing sound and a load of soaring crescendos, they work just a few chords, a few melodic ideas, and they work them very well: It's hard not to get swept away by it. This was one of the most purely enjoyable, uncomplicatedly gratifying rock shows I've seen in a long time. What made the concert particularly delightful was the absence of the Frames' violinist, Colm Mac Con Iomaire, who was home in Ireland with his wife and newborn child. A rock 'n' roll axiom: String sections = good (some of the time); single violins = bad (nearly all the time). The Frames' music hovers just on the edge of melodrama, and skillful though he is, Iomaire's violin pushes it over the edge every time. Frontman Glen Hansard comes across as an unassuming, appealing guy, and that's key to the effect of the music: His singing is nakedly, emphatically emotional, but there's something so humble and straightforward about it that you never feel you're listening to somebody whine or thoughtlessly emote. He's also a nimble showman -- amusing between-song banter, expert conducting of audience singalongs, and, turning up his collar, a dead-on Elvis parody for one line in the middle of a song. The Frames are on tour for the next few months (dates here). If they're coming to your town you should go; if not, check them out on "Last Call With Carson Daly" on March 9. And free music? But of course. "Star Star" and "Lay Me Down," both from the Frames' 2004 live record "Set List."